opening and bent neck in roses. Helps in keeping the rose stem’s “plumbing” free flowing. Effective at room temperature and in storage coolers. Product is clear in all water types. 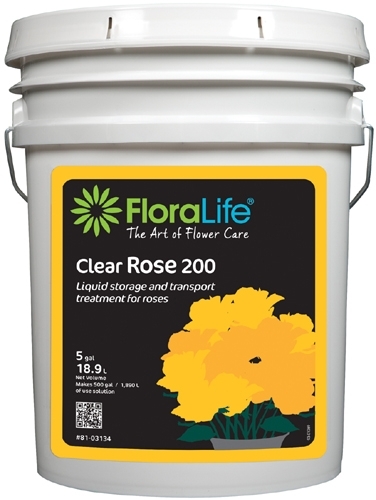 Aquafinish Clear 1 Gallon Floralife® Clear Ultra 200 Concentrate Storage & transport treatment, 55 gallon, 55 gallon drum Crowning Glory Clear Solution by Floralife - 32oz Spray Chrysal Clear Packets 5 Gram- 1000 ct.